CEDARBURG, Wis. Nov. 16, 2016 – Allied Industrial Marketing, Inc., the North American technical sales office for Frako Capacitors announced a dual purpose capacitor product line for the power quality industry. 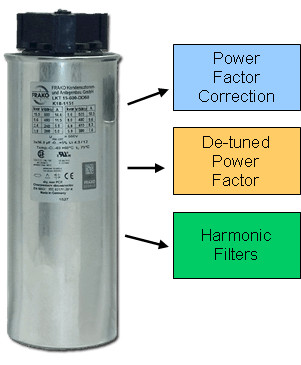 The Frako capacitor line is cURus and CSA approved. The unique design takes into consideration reactor voltage boosting and harmonics on the electrical system. Frako DD60 capacitors include triple safety features such as all 3 phases disconnect at over pressure and self-healing, segmented metalized film to protect against catastrophic failures. The DD60 capacitors are dry-type no leak capacitors (with only a thin film of oil applied to metalized film where it is most beneficial) eliminating leakage of oil which can occur in traditional oiled filled capacitors. The cylindrical design uses optimized geometrical shape and conforms to industry best practices for internal heat dissipation. Secure, maintenance free terminals, which offer anti-vibration connections and maintain terminal pressure for the lifetime of the capacitor, are factory installed on all DD60 capacitors. Type DD60 are available in voltage ratings of 240/264, 480/528 and 600/660. Also available are Type DP60 in voltage ratings 690 and 800V, with slightly different performance specifications.